Back for his fourth year, in a Southern, soulful voice, Levi gave tribute to Canadian singers/songwriters whose music shaped his own style and adoration of poetic lyrics. These people shaped him in his career and he sang some of their works and included songs which he composed thanks to their guidance. He featured numbers from his latest CD ‘Liberation’ which was released last March. He sang about so much goodness in this world. His light shines with positivity and optimism for himself and everyone in attendance. Paul Anka came to the forefront with his beautiful rendition of “Put Your Head On My Shoulder”. Levi performs without pre-recorded musical tracks. What you hear is all him: voice and piano. “I swear seeing ya’ll is the highlight of my year! Come welcome me back. All new show about a few Canadian musical icons I have an interesting history with. I’ll feature music from Paul Anka, Anne Murray, Leonard Cohen, Shania, Alanis, Sara and of course Celine and Foster. Also, you’ll find out what Canadian artists/producers inspired songs from my recent album “Liberated” I’m packin’ it in and leaving it on the stage as always. Can’t WAIT to see ya’.” O Canada is a premiere especially for his beloved Puerto Vallarta and its people. 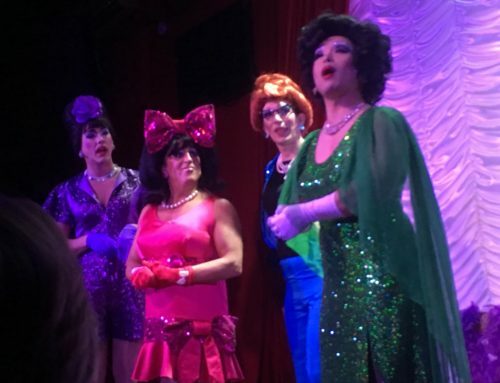 Pleasingly, he greeted guest artist Chi Chi Rones, one half of The Dueling Drag Divas and he delivered one of her special songs from this show, Edith Piaf’s “Non, Je Ne Regrette Rien” absolutely spectacularly. Close your eyes and Edith was on stage singing for you. Listeners were amazed and showed their appreciation. Very early Celine Dion was projected from Levi and his piano “Nothing Broken But My Heart”. Levi loves her catalog primed with songs by Canadians. Multi-talented David Foster was cited as an early influence on Levi’s life and career. The man is a composing, producing, arranging, performing giant. Those in the crowd who hail from Canada were especially pleased. He was awarded the Tony Award for his portrayal of Jerry Lee Lewis in Broadway’s Million Dollar Quartet. He has recorded seven CDs. A fireball struck the stage and the piano went wild with Jerry Lee playing “Whole Lotta Shakin’ Going On” [https://www.youtube.com/watch?v=OgmofqjWnyA]. Then the flames swept over the audience which erupted in volcanic love and appreciation. He had performed on The Late Show with David Letterman in 2010 as part of the Million Dollar Quartet singing a medley with ‘Johnny Cash’, ‘Carl Perkins’, ‘Elvis Presley’ and ‘Jerry Lee Lewis’ [himself, pounding those ivories with a fury like The Killer]. Shania Twain’s hit “I’m Outta Here!” was given a soulful approach with Levi moving his voice low to high in clear pitch and firmness. He is a Spectacular Entertainer. The brilliant Joni Mitchell was given tribute not only for her soft singing but her tremendous songwriting ability. Sadly, due to a show upcoming soon in the room, he announced his final song and chose Sara McLachlan’s “Angel”. The cordiality and refinement of the tune was matched only by Levi’s own demeanor and talent. A thunderous standing crowd wanted much more but that was not to be tonight. See all the cabaret show reviews here.